You don't need to be smart to own a smartphone. Now just take part in this Italian website contest and you might just win one! 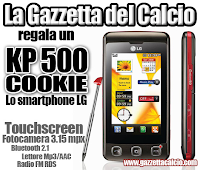 The sweet prize is a KP500 Cookie LG Smartphone which you can win from La Gazzetta del Calcio, an Italian website about football. Rules are very simple. To enter the contest, you need to write a blog post about this contest and include the provided image and link to their homepage and the original contest post. Contest ends July 16th, 2009 and the winner will be drawn randomly.